The pristine harbour of Sydney surrounded by historic sites, national parks and hundreds of kilometres of shoreline is by far the best place to spend your eventful days down under, the emerald city known for its architectural brilliance and splendid harbour is also a natural playground for diving, cruising and swimming. The lunch and dinner cruises of Sydney Harbour are world-renowned, the inclusions, state-of-the-art vessels and luxury amenities adds up to the numerous reasons why Sydney tops the list of best cruising cities in Australia. The natural harbour of Sydney has seen impulsive changes from its day of inception. The growth from a silent harbour to an eventful cruising hub occurred in a short time indicating the demand and popularity of an alternate tourism activity further boosted by top-line Sydney Harbour dinner cruises! In the past few years many cruising companies have tried to mark their presence in Sydney resulting in an assortment of cruising packages and vessels. The concept of sightseeing was redefined to entirely a new thought which highlighted the dining ambience. The waterfront dining which was prominent in Sydney Harbour was overshadowed with the upcoming of lunch and dinner cruises which solely concentrated on catering delectable food along with panoramic harbour views. The different vessels and wide range of cruising packages enticed both the tourist and the locals alike which in turn showcased a perfect platform for the cruising industry to establish their dominance. Sydney Harbour features amazing vessels from multi-million dollar catamarans to elegant glass boats, the aim of all the cruises remained the same, to offer their guests an amazing cruising time with luxury amenities. The world-famous attractions studded around Sydney Harbour is another reason why the cruising sector have boomed over the years, Sydney Opera House and the famous Harbour Bridge can be viewed up close from almost all harbour cruises. Choose from any of the numerous Sydney Harbour lunch cruises to see these best! The budget-friendly cruising package featuring unlimited buffet and premium drinks have claimed the spot for the crowd-favourite dining cruise. Sydneysiders and other oversea guests prefer this spectacular dining cruise over jazzy restaurants where you will have to pay a fortune for a reasonably good night out. The three massive outer decks of the multi-million dollar catamaran let you enjoy roving views of the harbour and bestow numerous photo opportunities with Opera House and other artistically designed edifices in the backdrop. Take advantage of a sunny day by relaxing on board the sought-after catamaran sipping a glass of premium wine or locally brewed Aussie beer. Your Sydney Harbour lunch cruise with air-conditioned dining saloon lets you treat yourself to a delicious lunch buffet freshly prepared on board. 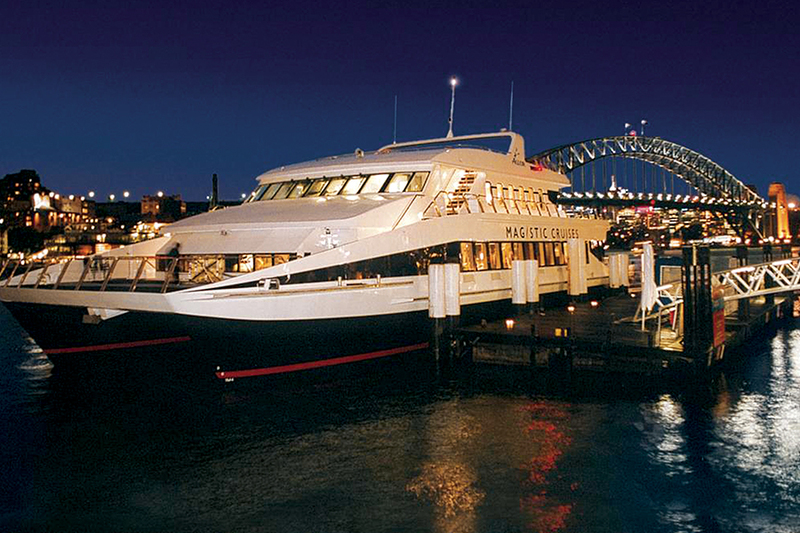 The vibrant Sydney lights studded along the harbour create a perfect dinner setting, the luxury vessel with contemporary design and latest amenities offer an all inclusive cruising package including premium wines, beer, soft drinks and delectable buffet served throughout the cruising time. Both lunch and dinner Sydney Harbour cruises are worth every penny and it would be a sin to miss it!